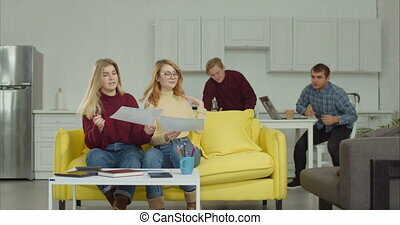 Positive young creative freelance team brainstorming, working and sharing ideas about new startup project while gathering at table and using laptop pc in home office. 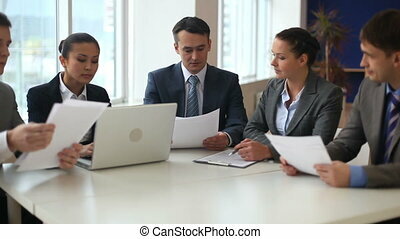 Multi-ethnic business team meeting brainstorming sharing new ideas. 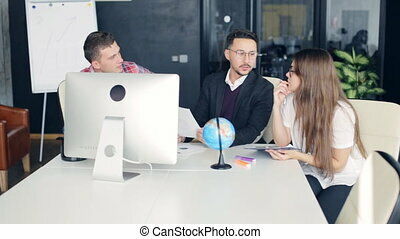 Young creative freelance team sitting on the floor, brainstorming, dicussing financial charts and graphs, sharing ideas and visions during meeting for project solution in home office. Top view of busy professional freelance team working with digital devices, analyzing financial charts and graphs while creating new startup business project and planning strategy in home office. 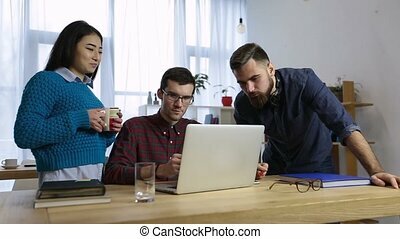 Creative freelance startup team sitting on floor in home office and working together on business project using smart technology devices. 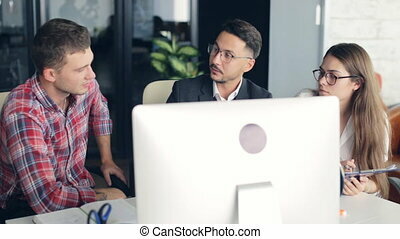 Diverse coworkers busy with digital devices working on startup. 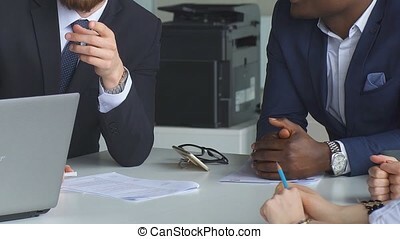 Positive skilled female freelancers finding creative solutions for new project, sharing ideas and strategy with cheerful male coworkers at creative office. 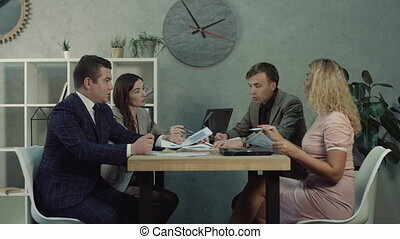 Team of freelancers discussing new startup. Two interior designers creating design for client and discussing architecture drawings with digital tablet. Young architects with tablet pc working on construction plans of commercial property. 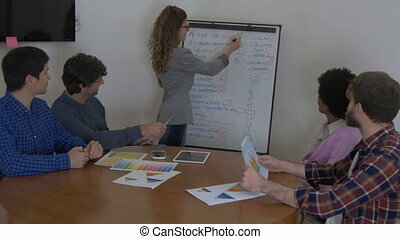 Creative business team brainstorming on meeting at office while creating new business strategy and startup business. 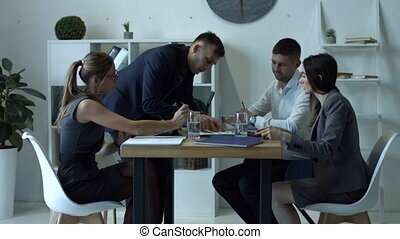 Professional business people sharing ideas and discussing project in boardroom. 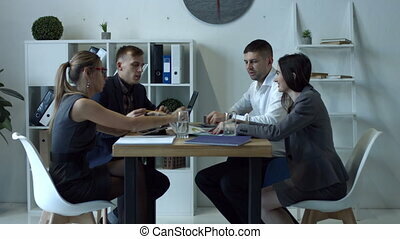 Skilled team of young IT programmers brainstorming during meeting in domestic interior. 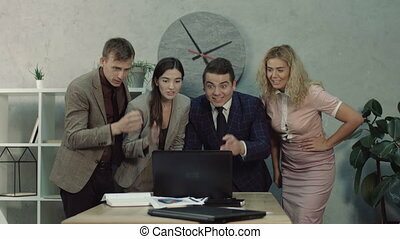 Handsome freelancers discussing ideas of software development at home using digital tablet. Busy bearded freelancer working on new business startup, networking online with laptop and writing notes while sitting on sofa at home. Handsome man with laptop pc creating new project in loft room. Positive classmates working on project together and cooperating as sitting on the couch in campus library. 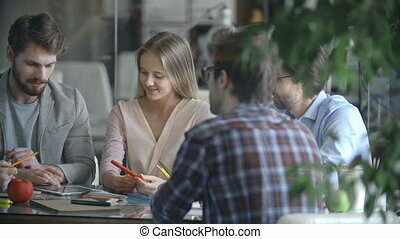 Cheerful university friends socializing and studying together for exam using digital devices. Exhausted sleepy female freelancer with laptop pc fallen asleep on sofa while working on new project late at night. Tired overworked woman napping while networking online with laptop at home. 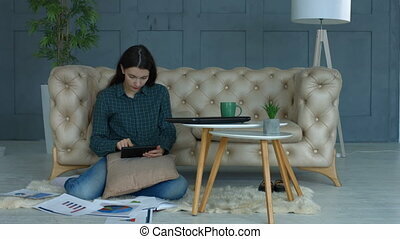 Attractive young female freelancer with digital tablet sitting on the floor near sofa in cozy living room while working on new business startup from home. Financial graphs and data lying on the floor. 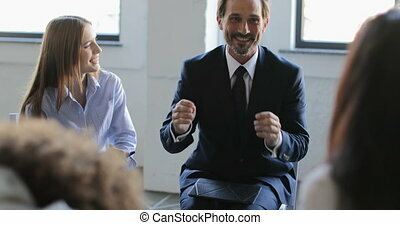 Group of positive coworkers making great business decisions and giving high five during meeting in boardroom. 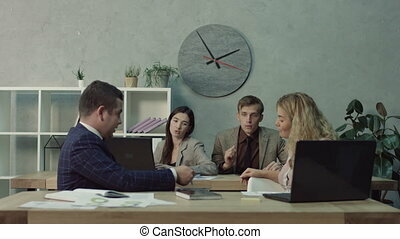 Cheerful bussiness people brainstorming and finding the way to increase sales in office. 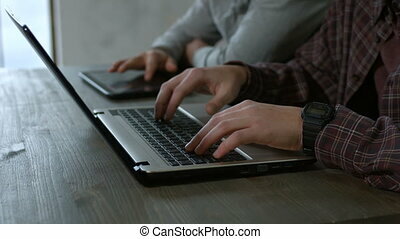 Closeup male hands typing on modern laptop keyboard and browsing the net on digital tablet pc on the wooden table. Side view. 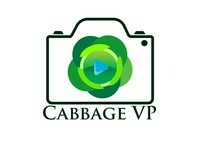 Young men working with laptop and tablet pc and networking.